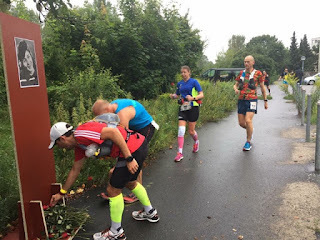 In 2014 I did two 24 hour races; both went badly. I said no more of these they took too much out of me both emotionally and physically and I couldn't deal with yet another failure. I decided to stick to 12 hour/100km type distance max. I spent a lot of last year injured. 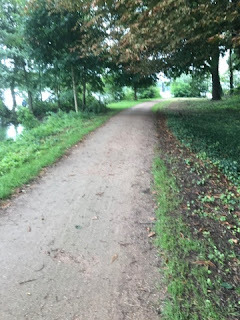 As I was starting to run again I felt that I was ready (mentally) to have another go at 24 hours I just needed to wait until I was ready physically. In April I did a 12 hour track race and in May 100km London to Brighton so was reasonably well prepared. 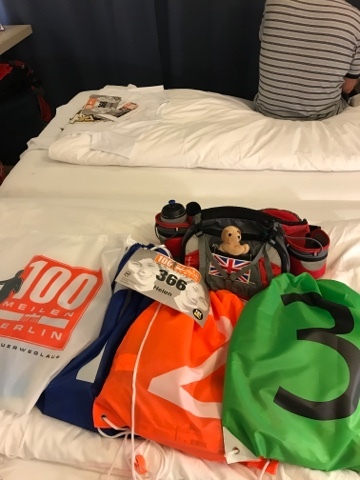 I had decided to go for the Berlin 100 mile race rather than a 24 hour as I have never actually done a 100 mile race even though I have always done more than 100 miles in 24 hours. The route follows the old Berlin wall. It is described as being flat but for someone who is used to 24 hours on a track it wasn't flat!! The hills are mostly fairly short, I remember thinking Phil might have found some of them hard on the bike! I ran them for the first few hours then walked as did those around The route was a mixture of pavements; tarmac or gravel tracks away from the road; forest and a few bits I didn't like of cobblestones (one long section and one shorter downhill bit around 45 miles which I walked as it was quite steep and I was worried about falling over). 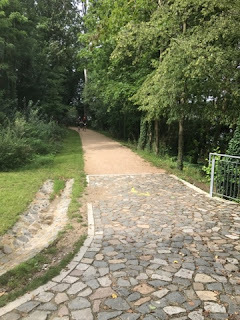 Although it had a lot of off road sections it was defiantly a road shoe run but a cushioned rather than light weight road shoe to give protection from the stones. 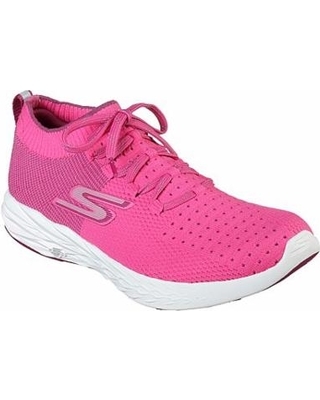 I think most people would go with something more cushioned anyway for 100 miles but I did notice a fast looking guy wearing skechers gorun which are my racing shoe! I was in go run ride which were perfect for the event. The course was really well marked with arrows on the ground; most of the time I could see the person infront so didn't really need to look for the arrows. There were 27 aid stations between 5-8km apart so if you are not fussy about what you eat/drink you don't need to carry much at all. There are 3 drop bags which you can collect after the race so you can put just in case things in these and if you don't take them you still get them back. We were staying at the H2 hotel which was next door to the H4 (race HQ). Number pick up was Friday afternoon then an English race briefing at 5pm followed by a pasta party which had a good selection of pastas and salads (included in race entry). The prize giving was at 2pm Sunday. You have to go to this to get your medal but get your T shirt at the finish. The race started at 6am. A shuttle bus was provided from the hotel to the start which took about 10 minutes. There was breakfast at the start if you wanted it (also included) and coffee. The start was at a stadium with plenty of space to wait indoors and the toilet queue was not too long! At registration we had been supplied with 4 bags. 3 were the drop bags and one the finish bag which was just left in the changing room. I noted a lot of stairs up to the changing room!! With about 350 solo runners (relays started at 7am) the start was a bit congested as too many slower people started at the front and we had to do 3/4 lap around the track. Fairly soon I was able to run at my own pace. When I say my own pace I tend to run to effort rather than pace so zoned in to 'easy effort' and take whatever pace that happens to be. This equated to a slower pace than I expected. I was not sure why as I was well tapered so my legs were fresh. I was quite tired from lack of sleep for a few nights and unnecessary other stresses so maybe that was why. The early miles ticked by quickly. At 10km we were given a rose to place at a memorial (about 20m later) of someone who was shot crossing the wall (its a different person every year). My plan was to walk for a few minutes after each check point and to walk the hills. 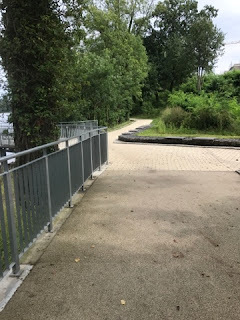 I somehow managed to miss the first check point - it was just water so probably smaller - so had my first walk at the second one just after 8 miles. I ran to here with Jon but lost him when I stopped for a walk. Found him again after he stopped for the toilet but soon after he was way ahead! 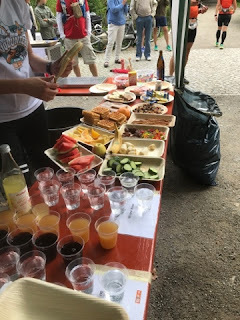 The checkpoints varied slightly but all seemed to have apples and bananas (chopped up) little cup cakes (really yummy bite size choc ones), waffles, gels, coke and water. There were other things but these are the things I took. AT each check point I had a cup of water or coke then grabbed some food to eat whilst walking. A few times I had to fill my bottle; we were told at the briefing we were not allowed to fill our own but had to hand them over to be filled- this was done very quickly so by the time I had handed it over drunk a cup of coke, grabbed some food it was handed back to me - they even put my high5/OTE powder in the bottle when I handed that over so that was one less thing for me to fiddle about with. There were a fair few road crossings. We were told in the briefing that crossing when the red man was showing could result in a DQ so there was a bit of stopping and waiting. This made it difficult to predict times/pace but I could tell from my garmin I was having a slow day when I looked at my real time pace. The first drop bag was at 33km. They seemed to have them all laid out in number order and only took a few seconds to get my bag. I decided to just take everything from my drop bag for quickness even though I didn't need it then I could throw the bag away. I had a few bars; drinks sachets and gels but up to this point hadn't used any of my own food. I knew I couldn't throw away my second drop bag as it had spare socks and T shirt in so thought I would faff a bit longer at that one with what I needed and didn't need. Probably spent about 3 minutes at that drop bag so not too bad I suppose. I found myself running bits with other people and bits on my own as different people had different run walk strategies so there was a lot of passing and being passed by the same people. This event is big on bike support. No bikes are allowed until check point 3 then they are allowed until the end. Mostly they were OK, there was only one who got in my way a bit as she wanted to be right by her runner at all times so would push past me unnecessarily. Phil was going to be meeting me on the bike at around 8.30pm just before it got dark and then stay with me until the end. A bit earlier than I would have liked /expected based on training runs my pace had slowed to 10-10.30mm. No idea why; I was feeling a bit sluggish and it was feeling harder than it should have done. My quads started to ache a bit somewhere mid 30s I think. This was far too soon. They had been totally fine on a 40 mile training run at a faster pace a month before. I was quite pleased to get to the 70km drop bag just because it gave me an excuse for a mini break! I had a sit down to sort out my drop bag. It had been raining most of the morning so I was going to change my T shirt and socks but about an hour before this drop bag it stopped so my T shirt was just a bit damp rather than wet. I sorted out the food I wanted to take which wasn't much as I had still mostly been eating the food which was provided. As my legs were feeling sore I put some more aloe heat gel on them as that takes the edge off a bit then off I went after probably 4-5mins. I felt fine leaving the checkpoint. I bit more tired than I would like to have been at 70km into a 160km race but often things don't get worse. I remember thinking that if I felt like this at 120km when I met Phil I would be very happy! Although my pace had slowed early on it seemed to have stuck at around the mid 10mm mark now so if it were to stay like that I could still have a decent race despite the initial early slow down. Here I should probably say that I do not aim for even pace in ultras of this length but rather keep the effort level about the same so the pace gradually slows down. 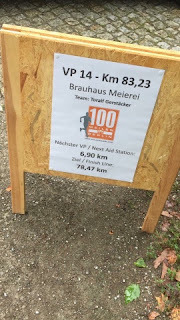 At each aid station there was a notice up telling you the distance; distance to go and distance to next check point. This was all in km and my garmin was in miles so as I left each check point I would work out the distance to the next one in miles then work out what that would be on my garmin. This kept me entertained for a couple of minutes and helped preserve the battery on my shuffle as I turned that off when I was doing sums!! Coming into the next check point at 47.x miles my quads were a bit hurty. Both my hip flexors were aching a bit but not too bad. I stopped to drink some coke and before I finished the coke I got pain like I have never had before in my hip flexor /upper thigh area. I sat down and took some Ibuprofen which I wouldn't normally take in a race but it was an emergency. Earlier in the year I had a bit of trouble in that area when I started doing faster long runs or racing marathons. It was always fine the next day but at the time would hurt. This was a similar area but the pain was far worse. After a couple of minutes I thought I might as well set off to the next check point walking to give the Ibuprofen chance to work. Even walking was really painful but I hoped the Ibu would soon kick in and all would be well again. After about 5-10 minutes the reality of what was happening started to dawn on me. Given how bad the pain was; even if Ibuprofen did work to take away the pain I would need to keep taking it as I still had another 50 miles to go. And given that it was bad pain something was not happy so running 50 miles on it was not going to be a very good idea. As I have had this before I know its one of those things which ease off as you run. At this point I should have turned around and gone back to the aid station as the next one was 6km away. However I wasn't quite ready to admit that my race was over. That 6km walk was horrible. Not only was I in pain but my race was over and lots of people were passing me. Some stopped to walk to ask if I was OK and a lovely English chap on a bike with his wife running cycled with me for a while and offered me money for a taxi - I hope that she finished as last year she didn't make it. Eventually I got to the aid station and was told how to get back to the hotel (bus then train). As the race is one big loop around berlin you are never too far from the city. It took about an hour to get back. This was a really well organised race and everyone (runners and volunteers) were so friendly and supportive. I will be back and would defiantly recommend it to anyone thinking of doing a 100 miler. I have never had a DNF in an ultra before. 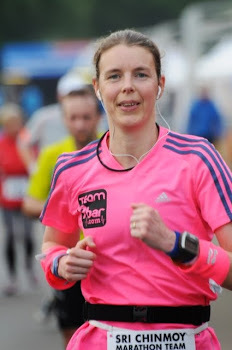 My only DNF was a marathon where I dropped down to half so not sure if you count that. Had this been another 12 hour race I would have been upset of course. However, it has taken me almost 3 years to feel ready to do another mega distance race so the disappointment is so much greater as well as the feelings of failure. The race was on Saturday. It is now Wednesday. As I only got to half way my legs have recovered pretty well. On the few short runs I have done my hip flexor has been 100% fine. I am not sure what went on but think it might be because I was running so much slower than normal so my running form was probably a bit off. Although I have had no bother with the hip flexor when running for several months (including 100km event) it was probably 95% fixed before the race as it did feel a bit uncomfortable in certain positions. So I am guessing as it was not quite fixed it didn't take too much upsetting for it to cause pain.